Kids who exhibit behaviors of oppositional defiant disorder (ODD) are not your typical kids. They behave in ways that scream “I don’t care what you want me to do” and truly have little or no regard for what their parents or society expect of them. Finding effective consequences for these kids is difficult. Unlike typical kids, ODD kids often act as if nothing matters to them, which can make it hard for you to know how to respond to their behavior and what consequences to give. So, how can you possibly make consequences effective for kids who don’t care about consequences? The good new is that you can make consequences can work with an ODD child. But, you have to know what kind of consequences to use. And you need to know that consequences that work with a typical child just won’t work with an ODD child. Read on to understand better how your ODD child thinks and the types of consequences that are effective with them. Your typical kids who are not ODD know there’s a line you just don’t cross and, except for testing limits sometimes, they generally follow your rules and respond to consequences. In contrast, ODD kids break the rules on a daily basis. It can wear a parent down to the point of feeling overwhelmed and exhausted. ODD kids also thrive on the chaos that comes from the battles you have over control. Sometimes they’ll even create those situations out of the blue. Maybe they’re bored, irritable, or having a bad day. Pushing a parent’s emotional buttons can be entertaining and gives the child a sense of power and control. When you experience this on a regular basis, you start to question yourself: “Am I doing something wrong? Is this my fault?” It leaves you feeling vulnerable, guilty, embarrassed and ashamed. It feels like you’re being judged by others—and, in fact, parents of ODD kids are often judged harshly by society. It feels very lonely. A typical child will allow you, as a parent, to have some type of control over their behavior. If you ground them, they’ll stay home. ODD kids will climb out the bedroom window five minutes after you’ve grounded them. Typical kids will change their behavior because they are uncomfortable with a consequence and don’t want to experience it again. Why does it seem like consequences aren’t working with your ODD child? Probably because you’re using consequences you would give a typical child. We usually expect a child will respond to consequences—loss of privileges or losing a parent’s trust—in a way that makes him uncomfortable, which will lead the child to change his behavior. The problem is, ODD kids will stand there while parents are addressing an issue or concern, and the look on the child’s face says it all: “I don’t care.” And often they’ll come right out and tell you they don’t care. Reactions like that can leave you feeling frustrated, furious and desperate to influence your child in some way. When emotions come into play, any logical approach to consequences goes right out the window. It becomes a control battle—and ODD kids are masters at the game of winning a tug of war. In our work with ODD kids and their parents, we use something called “Fail-Proof Consequences.” These are consequences that are effective with oppositional defiant kids because full control over the consequence rests with you, the parent. Much of our work involves showing parents exactly how to use this type of consequence. If your child has any control over the potential consequence at all, it’s not fail-proof. For example, if you tell your child he can’t use the internet, do you have complete control over that? Not really. Your child can always surf the web while you’re asleep or at work or even in the same room. ODD kids are brave and bold and think nothing of flaunting your consequence in your face, something a typical kid isn’t likely to do. Now, if you suspend the internet service for a few days or weeks, do you have complete control over that? Yes. You pay the bill and your child can’t get it turned back on without your permission. It may mean you can’t use the internet at home, but you still have ultimate control over that consequence. Understand that if it’s not a consequence you can live through, it’s not fail-proof. Your child may try to get around the consequence by going online at a friend’s house or somewhere else, but your consequence—that he isn’t allowed to use the internet at home—stands firm. Another example of a typical consequence parents often use is grounding a teen from the phone. Is it fail-proof? Again, not really. Your child can always sneak and use it when you’re not looking. But, if your child has a cell phone and you suspend service, is that fail-proof? Yes. You pay the bill and have complete control over the service. Your child may still have the phone, but he’s not able to talk or text on it. Could he get a track phone from somewhere else? Yes. But you have complete control over whether or not you’re paying for his phone. The consequence of shutting off the phone is fail-proof. To test the effectiveness of the Fail-Proof Consequence, ask yourself, “Will I be able to follow through with this in the face of my child’s potential out-right defiance and refusal to comply?” If the answer is “yes,” then you have complete control over the consequence. As adults, we tend to think of consequences as something that will change someone’s behavior—in this case our child. We believe consequences should go hand-in-hand with changing your child’s behavior. But that’s not always the case with kids or with adults. Just because someone experiences a consequence doesn’t necessarily mean they will change their behavior. If that were true, everyone would drive the speed limit once they received one ticket. Also, your ODD child may act like he doesn’t care but that’s not always the case. He’s not likely to thank you for giving him a consequence and he may not change his behavior. But by consistently giving and sticking to fail-proof consequences, you’ve done what you can as a parent. You’re teaching your child that when he or she does A, then B will always follow. Our job is to prepare our kids for the real world. In the real world, there are consequences. You, as the parent, are responsible for the consequence, not the behavior. Is It ODD or Conduct Disorder? 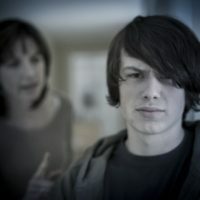 In those cases, you probably have a teen who has moved beyond ODD and into what is known as conduct disorder. In these cases, kids violate the rights of others and your fail-proof consequences will likely need to involve the police or the legal system. Parents often become frustrated dealing with those systems but there are some tips and techniques for ways to get the police or court to listen to you. Related content: Intimidating Teen Behavior: Is It ODD or Conduct Disorder? Each of us has a journey in this life—to decide who we are and what we want to be. ODD kids have existed since the beginning of time–they’re our rebels. They bring about changes in society because they simply will not accept the status quo. We need our rebels. They make us think—about who we are, ourselves—and they offer us many, many opportunities for our own personal growth. They possess strengths like determination, a strong will, and the courage to be different. Many of our entertainers, inventors, and successful citizens were oppositional growing up. Steve Jobs, creator of Apple Inc., and our own James Lehman, creator of The Total Transformation, were both ODD kids who went on to positively impact the lives of others. If everyone was the same—what a boring world this would be. When you’re the parent of an ODD child, it’s not easy. ODD kids challenge you and they don’t respond to the same kinds of parenting techniques that work with other kids. We’re here to offer you some new techniques that work, so you can hold your child accountable for his behavior and prepare him for the real world. Please keep reading—and don’t give up hope. We know what you’re going through and we can help you survive! Is It Time to Call the Police on Your Child? WebMD: What is Conduct Disorder? 4. Defiant Child Behavior: Is Your Child's Bad Behavior Escalating?